Ailsa Frank Wellbeing Ltd Newsroom | Has disrupted sleep left you feeling exhausted? Sleep is fundamental to your mental and physical wellbeing, so it is essential to get it right. A lack of sleep has a knock on effect on your whole life causing more anxiety, depression, exaggerating health symptoms, creating a poor performance at work and irritability in relationships. According to 'Public Health matters', links between a lack of sleep and high blood pressure, heart disease and diabetes are emerging. It also makes us vulnerable to infection and raises the risk of accident and injury. Losing sleep can feel like a small matter at first, but over time it can become frustrating and debilitating. Do you hear yourself say 'I am so tired I must be able to sleep tonight', but you don't sleep when you get into bed. Do you wonder if you have dementia or is your poor memory and lack of concentration due to sleep deprivation? Insomnia can be triggered by a change in events in your life, such as when children are born, worry over a sick or elderly relative, a heartbreak or loss, a career change, money stresses, work pressure, difficulties at home, relationship issues or marriage problems, and health changes (e.g. menopause, pregnancy, time of the month, headaches, pain, M.E. / chronic fatigue, cancer). If you don't find a way to break the cycle of bad sleeping patterns, it can become a lifelong issue. Hypnotherapy is an effective tool to reset sleep patterns and is useful in two ways, firstly to deal with the upset in someone's life which may be causing the sleep problems such as a breakup, fear of redundancy, exam stress, family arguments, alcohol problems or a confidence issues. Secondly, hypnotherapy resets the minds ability to re-establish sleeping habits without medication. When looking to resolve a sleep problem try to look for the external factors and underlying issues which may be causing sleeping issues. 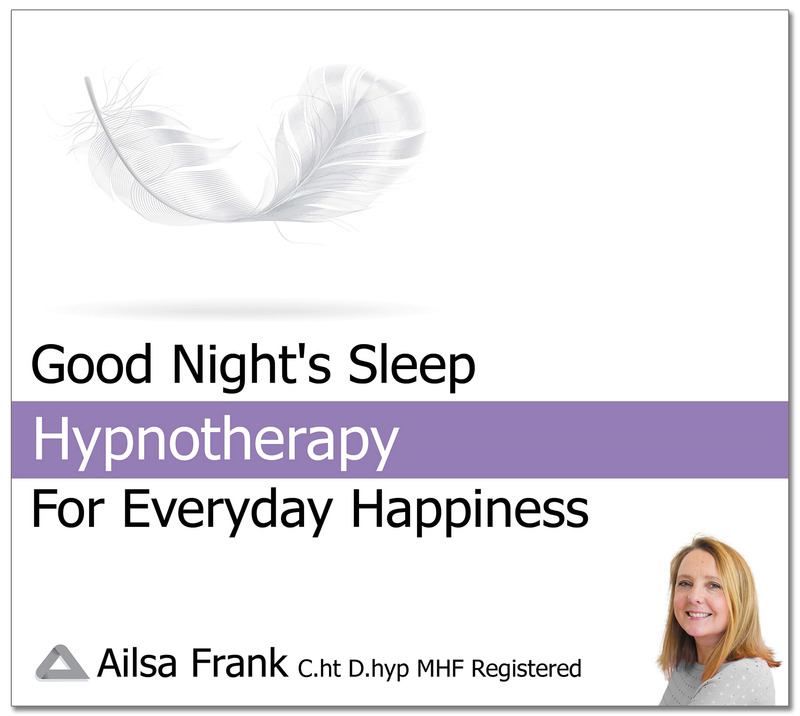 Ailsa Frank's sleep hypnosis download has been carefully crafted to set you free from past sleep issues such as waking or worrying in the night, bad dreams, difficulty getting to sleep or poor quality of sleep. It is suitable for anyone wishing to enjoy a good night's sleep. The exercises and techniques will tap into your natural sleep patterns so you can feel refreshed in the morning having had a full night's, deep sleep. There are so many elements that need to be right for a good night's sleep, so the messages in this hypnosis download will allow you to restructure you waking day and pre-bedtime sleep preparations enabling you to get to sleep fast and cope with your waking day well. Press the play button at bedtime, then drift off into a deep slumber. Also useful for night shift workers and to counterbalance time zone changes and jet lag. Testimonial: "After listening to the Good Night's Sleep hypnosis recordings I am out like a light and wake feeling refreshed like never before." ‘Good Night's Sleep’ hypnosis download recording is priced £12.99 available from www.ailsafrank.com 90-day money back guarantee. Ailsa Frank is a hypnotherapist, motivational keynote speaker and author of Cut the Crap and Feel Amazing published by Hay House. Through workshops, one-to-one therapy, her range of hypnosis downloads and book, she has already helped thousands of people to improve their lives. She works with an array of topics including alcohol, stress, relationships, anxiety, depression, confidence and business success.